… and get out the cheese, apples, and hot tea! A contribution to this week’s Photo Challenge, Reward. 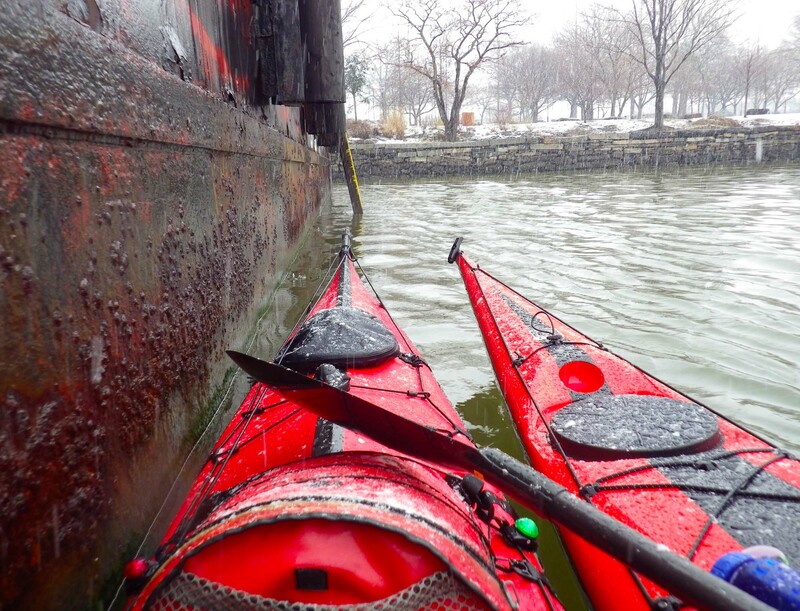 This entry was posted in Kayaking, Photography and tagged Kayaking, Manhattan Circumnavigation, Photography, postaweek, postaweek2015, Reward, Weekly Photo Challenge. Bookmark the permalink. Peaceful to me. The vibrant colors of the water. 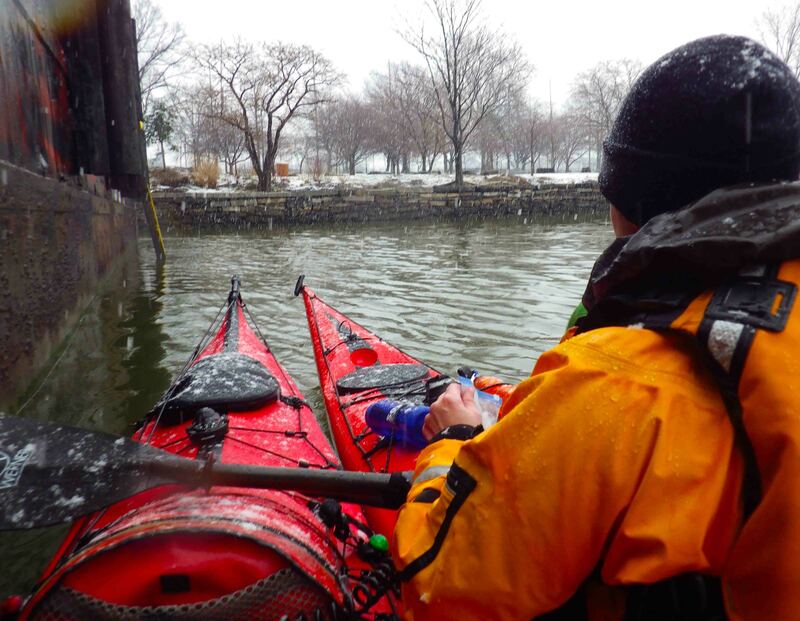 I kayaked through a good chunk of last winter but this year… Brrrr. looks cold! Hot tea was a good choice. I really love the colour spread! Nice photos, especially the last one. I certainly was thinking of you when I made my round-trip in one day to NYC and back, especially while driving south along Hudson Parkway looking at the river. I easily felt the attraction to exploration of the city because of your wonderful entries. I can actually taste those apples and that cheese; feel the warmth of the tea trickle down my throat. It’s worth becoming cold and hungry to gain such pleasure from the experience of satisfying one’s needs…isn’t it just!? very cool @ ussual…. 8-) …. er kewl as i would say :) lol…. Proves how totally committed you two are to the water! Stay warm! 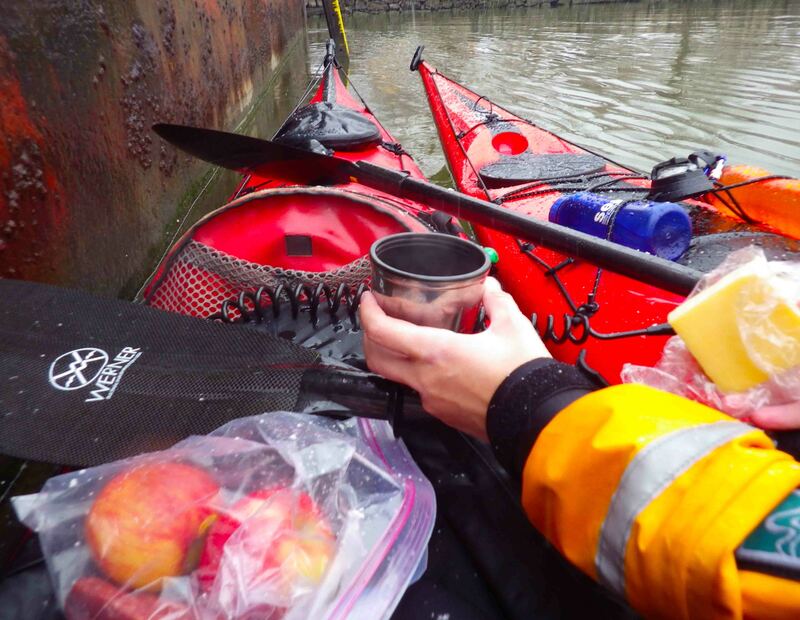 Brrrr……only you would consider apples and tea in freezing weather on the water to be a reward Vladimir LOL! But great shots. Especially like the first. Looks Cold, but rewarding indeed. Thanks for sharing this as all of us love it. I trailer to put ins unless I’m using one of the short pyrhanas (I used to use a very heavy Loon 111 because it was my first and it broke ice like the Coast Guard.) I cannot imagine the logistics of launching a sea kayak in the city. I cannot imagine how one gets the kayak from your apartment to put in. Nice photos. I wish I was there. Actually, it’s very simple: We launch from a shipping container where the boats are stored! You’re right that bringing a kayak from an apartment is a nonstarter–unless it’s a folding boat. So launching for us is relatively easy: Open the container, extract the boat, load it up, carry down to the dock, and launch. Ice-breaking, on the other hand… now that gets tricky in any boat! Love the full blog re the maiden voyage!